The county of Achaia is the northern most region of the Peloponnese, and is home to the city of Patras, the capital city of the Peloponnese. Patra is the largest city in the Peloponnese, and the second most important port in Greece after that of Pireaus in Athens. The port of Patras is the departure point for travellers wishing to visit the beautiful islands of the Ionian, as well as routes to Italy. Patra is one of the most important transportation hubs in the region, and offers visitors the chance to explore the regions of Mainland Greece, as well as other counties and towns spread out in the Peloponnese. The historic and beautiful town of Kalavryta is one that is very popular with visitors to Achaia, and there are some very interesting sights that one can enjoy here. One of the most popular attractions is the narrow-gauge railways, that travels to the town of Diakofto on the Corinthian Gulf. There are some very nice coastal towns and resorts in Achaia which are perfect for the summer months. Along the coast, you can find some beautiful sandy beaches, and crystal blue waters. The coastal village of Akrata is one such place. 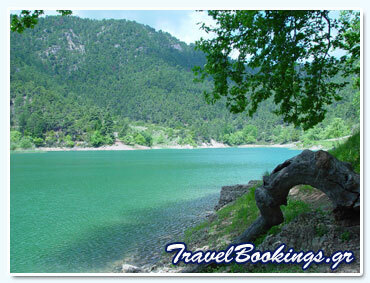 Located 15km from Kalavryta is the famous ski centre of Helmos. During the winter season, visitors can enjoy ski and winter sports here, with their first rate facilities. Achaia is an excellent base in the Peloponnese, from which one can easily venture out, and explore the surrounding areas. There are some truly special places and sights to see here, and it is an ideal destination to visit throughout the year. Below you will find information about the current accommodation and hotels that we have available in the Achaia region of the Peloponnese in Greece. For more information about the accommodation or hotel, or to check availability and rates, simply click on the corresponding button.